The Organization of Women in International Trade www.owit.org is a worldwide nonprofit organization that focuses on helping women develop and execute global trade opportunities. Its membership comprises women and men sharing knowledge, mentoring peers and youth, connecting with counterparts in other countries, and exchanging business contacts and referrals. OWIT’s strength is the global expertise of its chapter members, who are committed to planning and executing business opportunities involving international trade and business. "United Around the Globe to Foster International Trade and the Advancement of Women in Business"
This growing network provides a collective forum to support education, to facilitate information exchange, and to promote networking. In pursuing these goals, OWIT strives to provide a rewarding volunteer environment, to stay at the forefront of trade and technological developments, and to work in cooperation with peers and alliances. OWIT began in the mid-1980s, when groups of women in several locations across the U.S. formed local groups with similar goals to advance career and trade opportunities. At the time, international trade saw few women in upper management positions, presenting a growing need for women in trade to be able to connect to one another. Most of the organization’s founding chapters developed independently, with minimal knowledge of each other. As awareness grew, a vision formed of an expanded international trade network. OWIT was officially established in 1989, when the organization held what would become its inaugural board meeting in Los Angeles. The following year, OWIT organized its first national conference in Washington, DC, and published its first membership directory. The organization had 12 chapters at the time. Today OWIT has 25 chapters, with 3,000 members in eight countries. It is recognized worldwide for building ongoing trade relationships within and between global communities. 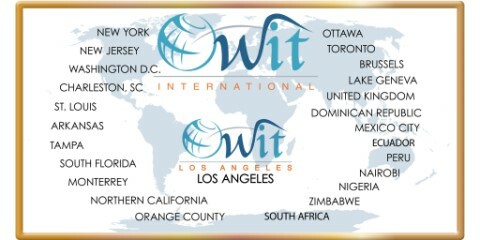 OWIT chapters are located in North America, South America, Western Europe, Asia, the Middle East, and Africa. Local chapters host networking meetings, educational seminars, and special events; offer scholarships; and support charitable organizations. These ongoing initiatives provide members with a broad range of experiences and information. In addition, OWIT hosts a webinar series on topics related to international trade and business. In keeping with its mission, OWIT annually recognizes a Woman of the Year as an accomplished businesswoman who helps others aspire to careers in international trade.